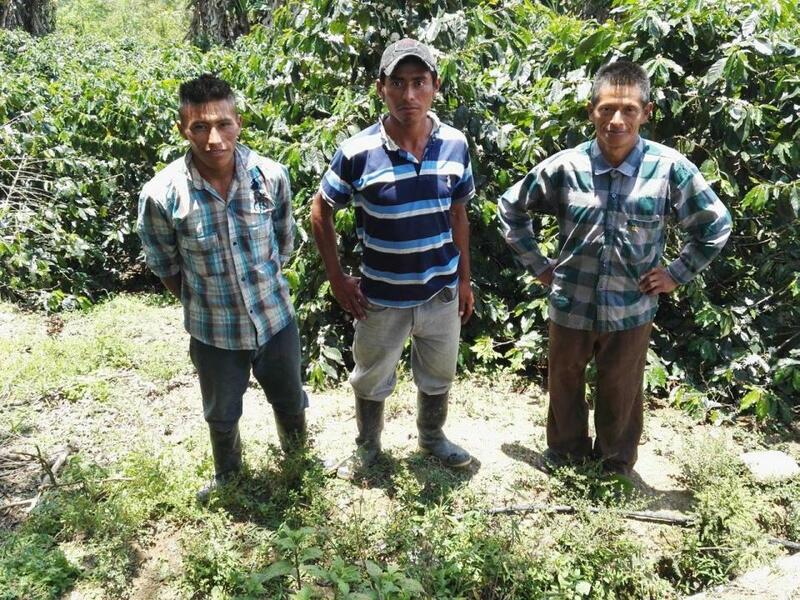 A loan of $1,625 helped a member to buy fertilizer and manure to prepare land to plant coffee. Santiago is 44 years old, married and has eight children. He lives with his family in a village that belongs to the municipality of Intibucá. He has been growing coffee on his own land for over 9 years. He sells his production on the local market, which is how he gets his revenue. He is requesting his second loan from the institution as a group loan with the goal of buying fertilizer and manure to prepare land to grow coffee and assist his plants. His plan is to continue to expand his production to obtain greater economic stability and use his earnings to provide his family a better quality of living. The group is called G.s San Bartolome and is made up of three members who live in the same community and make a living growing coffee. The group loan is for 38,000 Lempiras and will be used to seed, fertilize and expand their coffee crops. In the photo they are: on the left Jose Lino, Jose Martin and Santiago is on the right. Santiago de 44 años de edad, está casado, tiene 8 hijos, vive con su familia en una aldea que pertenece al municipio de Intibucá. Tiene más de 9 años de cultivar café en su terreno propio. Esta producción la vende en el mercado local, del cual obtiene sus propios ingresos. Ha solicitado un segundo préstamo a la institución en forma grupal, con el fin de comprar fertilizantes y abonos para preparación de terreno para siembra de café y asistencia al mismo. Su plan es seguir ampliando su producción para obtener una mejor estabilidad economica y utilizar sus ganancias para darle a su familia una mejor calidad de vida. El grupo se llama G.s San Bartolome, formado por 3 miembros, que viven en la misma comunidad y se dedican al cultivo de café. El préstamo grupal es por 38,000 Lempiras y lo utilizaran para sembrar, abonar y ampliar sus cultivos de café. En la foto se identifican así: a la izquierda esta Jose Lino, Jose Martin y Santiago a la derecha. It helps the people of a historically disadvantaged community access financial services. This loan is part of ODEF Financiera's efforts to extend financial services to the Lenca community, an indigenous people living in Honduras and El Salvador. With low interest rates, these loans will help community members to invest in their farms and to run small businesses. ODEF also provides financial literacy classes and access to savings accounts for members. By supporting this loan, you are helping to bring financial services to an historically disadvantaged community.